A CAMPAIGN is under way to help a Nurney mother of five purchase a wheelchair accessible car for her eight-year-old son. 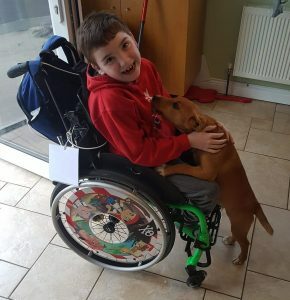 Lyndsey Keogh is appealling to the community to help her purchase the car as her current vehicle can’t fit her son’s electric wheelchair, leaving the family often isolated and housebound. Young Alex has been diagnosed with polymicrogyria, a brain condition which affects muscles, speech and swallow. Alex doesn’t walk or talk and is fed through a tube. Not only is Lyndsey a full time carer for her son but her youngest child has autism. “My little girl has autism also. It’s hard for the other three children. “It’s not fair on them. I don’t like saying it but they’ve already lost part of their mother as so much of my time is spent dealing with the smaller ones. They don’t get to go and do many things. A wheelchair accessible car would make the world of difference to the family but a second hand one costs in the region of €10,000 to €14,000. Lyndsey said she feels embarrassed asking for help but really has been left with no other option. “I just don’t know what to do. The only help the government gives is when you have enough to buy a car, you can get it tax free or if its brand new there’s no VRT on it. “I’m not joking; just today the battery went in my car and I need to replace it. I’m after putting a fortune in to it. “Alex has grown out of his manual chair so our only option is to bring the electronic one and that just doesn’t fit. Lyndsey set up a GoFundMe campaign to help raise money and almost €2,000 of the €10,000 target has been reached. Lyndsey said Alex is a very happy child always laughing and smiling. “He’s amazing despite the conditions he has. We’d just be so grateful if people could help in any way they can,” she said. To donate to this worthy cause visit https://www.gofundme.com/f/hzg6rg-wheelchair-accessible-car.